Today, by the time people are diagnosed with Alzheimer’s, they have likely had the disease for 20 or 30 years, and medications are largely ineffective in reversing the decades of cognitive damage. That’s why sophisticated brain scans and other technologies could help change the course of Alzheimer’s disease, which is linked to a sticky buildup of amyloid plaques that kill brain neurons. Diagnostics are under development now to check people for this problem in their 30s and 40s, says Dr. Lorne Label, MBA ’98. At the same time, new medications are being explored to block the enzyme pathway leading to amyloid plaque production. 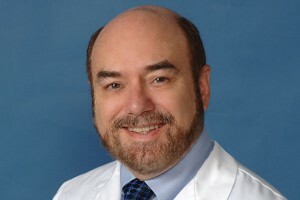 A clinical professor of neurology at UCLA and in a Thousand Oaks private practice, Label will present “A Glimpse Into the Future of Neurology” at the third annual Cell Biology Symposium on April 10 at Lundring Events Center. He holds a Cal Lutheran MBA in healthcare management. As wonderful as technology can be for connecting us with distant friends and family, Label is even more impressed with its potential for transforming the field of brain medicine. New healing modalities that incorporate computer chips and make use of robotic devices are getting faster, smaller and better, just as personal computers did before them. “New, more powerful computers come out every two years – that’s how fast the technology is changing – and a lot of that technology is going to be used for the brain,” Label said. Then there’s the burgeoning field of nanotechnology, which makes use of microscopically tiny computer chips and other devices. Says Label, “There’s also some interesting research being done in trying to ‘re-energize’ the hippocampus” – the part of the brain that’s largely responsible for memory and is one of the first areas damaged by Alzheimer’s – by implanting computer chips that could restore memory. For example, people who have lost a limb will find help in prosthetic devices made possible by breakthroughs in human-computer interaction. “They can get an artificial limb where they’ll be able to control the fingers and the grip” simply by thinking about it, the same way an actual arm works. The Cell Biology Symposium will run from 9 a.m. to noon on April 10 in Lundring Events Center. Everyone is welcome. RSVP to catalyst@callutheran.edu. For details, write to assistant professor of biology Chad Barber at cbarber@callutheran.edu.